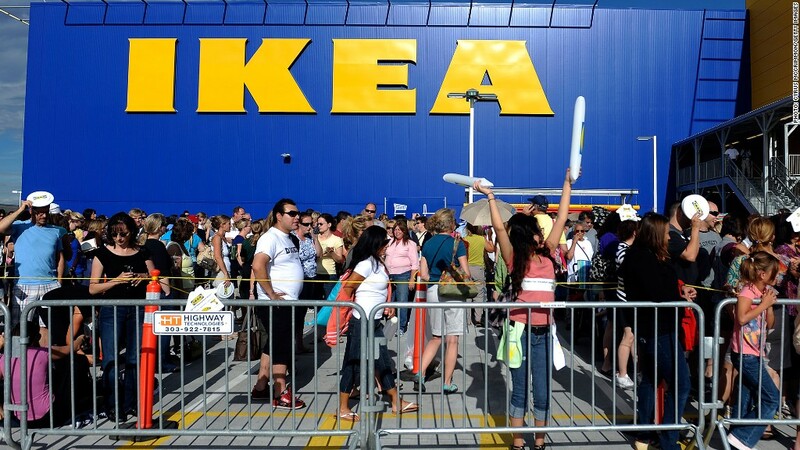 Ikea may have revolutionized shopping for flat pack furniture, but oh, all that walking and those long lines. Not to mention the parking lots. The Swedish company thinks it has the answer. Its testing a variety of smaller stores in the United Kingdom, Spain and Norway to find out if customers will happily order home furnishings and inexpensive art online, and then collect their shopping from a smaller store. One trial store is only a tenth the size of a normal Ikea. "We will use these tests as an opportunity to find out more about how customers want to shop with IKEA in these areas," Ikea said in a statement. The chain is even considering a store on London's Oxford Street at the heart of the city's shopping district. "Click and Collect" locations are popping up all over the U.K.
Amazon (AMZN) collection lockers can now be found at train stations and gas stations. Start-up Doddle has 44 sites around the U.K., mostly in train stations, and calls its service "Commute and Collect" for online orders from fashion retailers and also from Amazon. eBay (EBAY) now has "Click and Collect" in more than 750 stores of the British chain Argos. While a smaller Ikea might make it easier to pick, or return, what you've bought, it won't help you with the instructions to assemble that dresser.